satisfying and good for the body! combined with fresh tomatoes and various herbs to create the perfect beginning to a healthy meal! make you understand how delicious healthy eating can be! 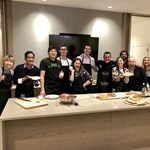 The Cocktails Mixology Class Team Building event has been a favorite corporate team activity for many companies including Ernst and Young, Brown Brothers Harriman, Microsoft, Bain ... moreCapital, Agios Pharmaceuticals, Deloitte, Vista Print, Booking.com, Amazon, Intel, and Google. The environment and overall experience are exceptional. 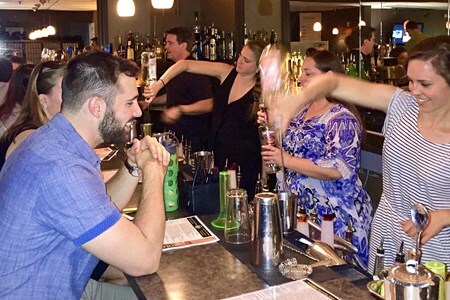 The bar ambiance is welcoming, music is upbeat, and guests are behind the bar shaking margaritas, stirring martinis and learning craft cocktail techniques. 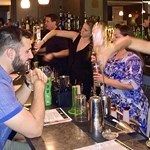 There are lots of laughs as guests order drinks from one another and compete in cocktail trivia. Guests are greeted with sparkling cocktails and enjoy additional cocktail tastings throughout the event. The event includes a gourmet cheese platter and charcuterie board. Additional catering options are available upon request. Italian Dinner with Tiramisu Finale! 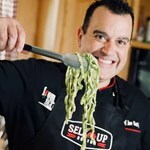 This culinary event is packed with action, entertainment and absolutely best Italian food possible. We are going to start by making fresh Italian salad in Parmesan crust baskets, stretch ... moreour own mozzarella cheese and make four types of pasta, with different fillings and sauces! While the fresh salad and wonderful pasta dishes created here are certainly spectacular, the major draw of this class is learning how to make one of the most delicious Italian desserts in existence, Tiramisu! This beloved sweet treat consists of ladyfingers drenched in espresso. These ladyfingers are then layered with a sinfully delicious mixture of eggs, sugar and mascarpone cheese! This is a dessert that many people think is too complicated to make at home, yet here you will learn how to re-create this dish that is sure to please the whole family! Grab your friends and book an evening to learn one of the most valuable and entertaining culinary skills around, creating fresh pasta! 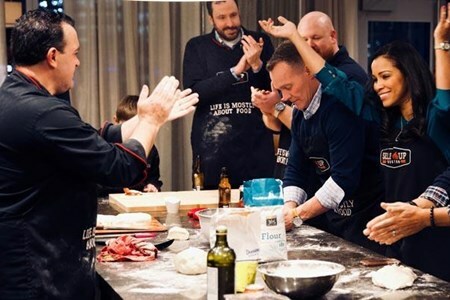 Once you have experienced freshly made pasta, ... morethe stuff from the box will never taste as appealing, and you can learn to create this delicious Italian staple at the instruction of an authentic Italian chef while creating a memorable evening with those closest to you! 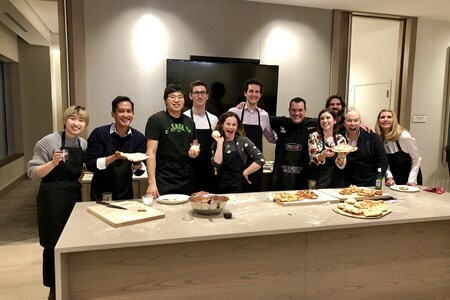 This class is somewhat unusual, as the majority of Boston cooking classes tend to shun traditional Italian cooking, so this is a real treat, as just about everyone loves pasta! 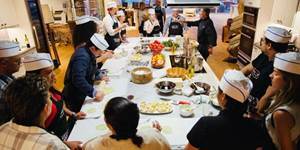 As a group, you will learn how to make two different kinds of pasta from scratch. These are tortellini and gnocchi, both of which are absolutely amazing in their flavor and consistency. As we all know, it is not just the pasta that makes the dish but the sauce as well, so the evening will culminate in the creation of a deliciously authentic ragout! Afterward, the best part awaits you, which is enjoying a well-deserved indulgence in some delicious food coupled with a perfectly paired glass of wine! Learn to make pizza that rivals any pizzeria! 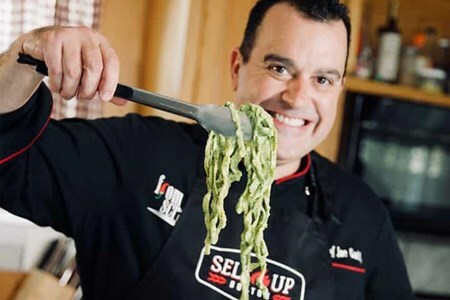 Chef Joe Gatto will start off by guiding you through the process of making your own homemade extraordinary Pizza dough. Just when you ... morethink your mission nears its end, you will realize that things are just starting to happen. Out will come bowls with hot water, salt and ice, and you will move on to stretching your own Mozzarella cheese. With top-notch dough and freshly made cheese, there is only one thing left to build an ultimate pizza pie, the toppings! 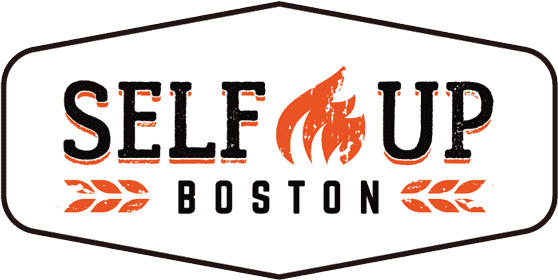 You will have a plethora of those to choose from to put together your own world-class pizzas and calzones. This event includes a craft cocktail add-on presentation and tasting. 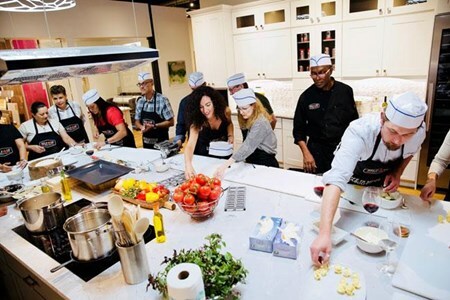 Grab your friends and book an evening to learn one of the most valuable and entertaining culinary skills around. Guaranteed your team will love our classes and have the best times of their life.